This AEG freestanding washing machine is perfect for saving you both time and money. It’s packed full of handy features and has an impressive A+++ energy efficiency rating. It’s hard to find time to do the ironing, so AEG has made this task a little quicker with ProSteam technology. By adding steam to the end of the wash cycle, the PlusSteam option will reduce the number of creases in your clothing by up to a third; not only will this cut your ironing time, but will also keep your clothes in better condition. As well as adding steam to the end of the cycle, the L7FEE842R has a Steam Refresh programme. This programme is perfect for giving your delicate, dry-clean only items a quick refresh, meaning fewer trips to the dry cleaners - saving you time and money. The innovative ProSense technology also keeps your clothes looking newer for longer. Clever sensors will measure the wash load and choose a tailored cycle for your needs. This precision will decrease wash times while providing the best treatment for every garment. Nothing beats the feel of clean clothes against your skin, and it’s about to get even better. The Soft Plus feature improves the distribution of your fabric conditioner to make your clothes softer than ever. Even big brands like Ariel and Lenor certify this washing machine for great cleaning performance. For those with sensitive skin, the Extra Rinse function adds more water to help flush out any detergents left from the wash.
And, the Wool Plus cycle takes the worry out of washing your winter woollies. Woolmark, the world’s leading wool authority, certify that this programme is just as good as handwashing. This fantastic AEG washing machine has a collection of technical features to make sure you can clean your clothes without a hitch. These include time-saving options, a child lock and anti-flood protection. Also, can you believe that an appliance with this many functions can be so energy efficient? The OKOInverter motor makes sure the L7FEE842R uses the lowest possible energy consumption while still delivering the highest efficiency and durability. 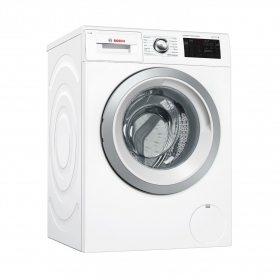 The L7FEE842R has an 8 kg drum and a maximum spin speed of 1400 rpm, making it perfect for families. Plus, it has a clean white design to fit in perfectly with any home interior. 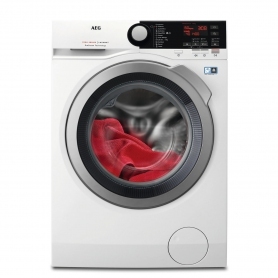 This amazing AEG washing machine is exclusive to Euronics and Agent stores. Add the L7FEE842R to your basket today.